London Design Festival celebrates and promotes London as a design capital, and takes place in hundreds of venues and institutions throughout the city every September, showcasing design projects and products from all over the world. This year we were delighted to have been selected to show as part of Brompton Design District, in one of the vacant retail spaces on the prestigious Brompton Road, allocated to designers by South Kensington Estates. Our exhibition in a vacant ex-coffee shop, entitled “From Rain to Loom” explored our work with the Kala Cotton Initiative in Kutch, a dry, remote and deprived area of Gujarat in north west India, sharing a border with Pakistan. 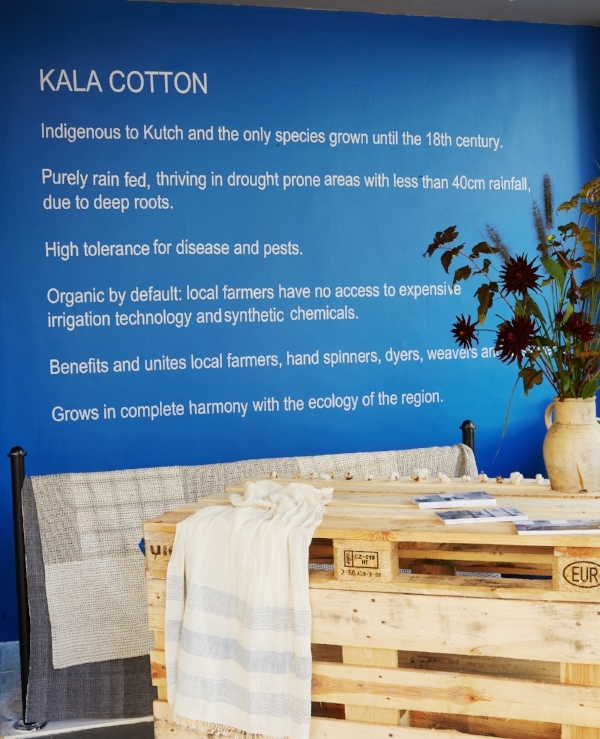 Here, kala cotton, which is an indigenous and genetically pure species of cotton, is making a comeback helped by an NGO, Khamir, who pay a premium to farmers to switch from genetically-modified, irrigation-dependent bT Cotton, to the old Kala cotton, which is purely rain-fed and needs no additional irrigation. This cotton positively thrives on the 40cm or so rainfall which Kutch receives each year - this level of rainfall means that Kutch is officially known as a “drought-prone” area. Due to a deep root system, and possibly thousands of years of cultivation, this species survives well with little water, high levels of soil-salinity, and is resistant to pests and disease. This last feature also means it is grown organically by default. We buy all our kala cotton fabrics from this NGO who connects the farmers with the local spinners, dyers and weavers. We use these fabrics to make our patchwork kantha quilts and other textiles which we exhibited at “From Rain to Loom”. The Kutch region is well-known for its White Rann or dramatically wild salt marsh, but it is also home to many textile artisans, including weavers, embroiderers, quilt-makers, spinners and dyers, most of whom have been practicing their craft for generations in the villages. The exhibition programme for Brompton Design District is curated by leading design consultant, curator and writer, Jane Withers. It encourages design that adds meaning and value to our everyday lives. 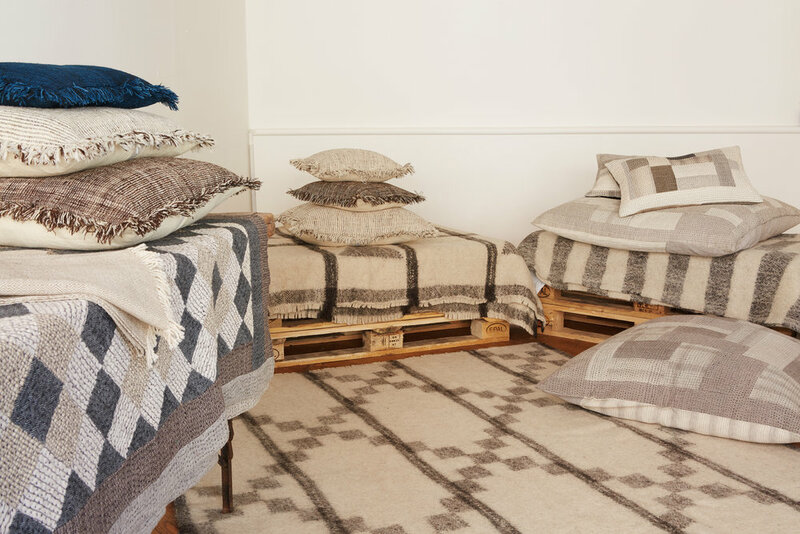 As a platform for emerging designers, it further adds to the energy and dynamism of the area. For the 2018 programme, the theme was “Material Consequences” looking at the impact of the materials and resources we use in product design. On the Thursday, we hosted a talk in our exhibition space with Graham Hollick, director of Stitch by Stitch, and Fernando Laposse of the Totomoxtle Project (also exhibiting next door) talking with Edwina Ehrman, curator of “Fashioned From Nature” at the V&A Museum. Fernando’s project with indigenous corn species from Mexico which he uses to create colourful veneers and marquetry, was the perfect fit with our work with Kala Cotton. Thank you to our great friend Beth Evans for these lovely photos. 200ml Hendrick's Gin, 200ml Madeira Wine, Two Teaspoons Brown Sugar, Six large Lemon and Orange Twists, Small slice Orange, One fresh Pineapple, Four spoons Honey, Juice of two lemons, Three Cloves, pinch nutmeg, teaspoon of cinnamon powder. Mix all ingredients in a saucepan and place on the heat. Let the concoction simmer for 20 to 30 minutes. Taste, adding lemon or honey depending on whether you like sweet or sour. When it’s ready, pour into a teapot and serve in teacups. Alternatively serve in a traditional punch bowl. Can be reheated so you can make ahead! Garnish with Pineapple Wedges and a ginger biscuit.